Perfect venue for the perfect day! 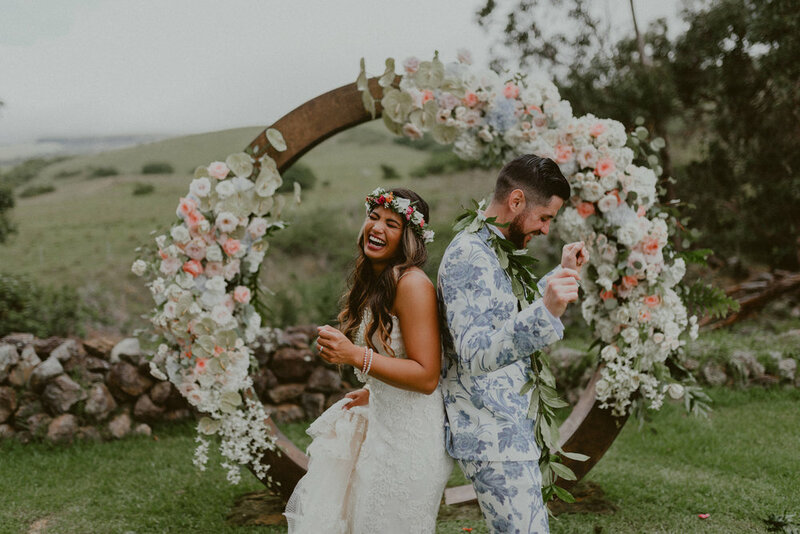 “Anna’s Ranch is an elegant and beautiful wedding venue, set amongst rolling green hills, an open sky, and the cooler temperatures of Kamuela. There is ample room to explore , with varying backgrounds for pictures whether it be in the garden, amongst the eucalyptus trees, or out on the open lawn. Love, Flowers & 20 Second Dance Parties. Leslie & Cano tie the knot. Get all the details from the design group themselves on Bliss In Bloom's Blog. This Wedding Was Off the Chain - Dance Party Action! Featured on Green Wedding Shoes, Leslie & Cano's wedding was a fun filled event for their family and friends, showcasing their individual style, complete with floral wall, donuts and gold grillz. Read all the amazing details in the feature. Featured on Sky & Reef Photography, "Three words to describe Anna Ranch: Old-Hawaii, Rustic and Tranquil." Honored to have been featured on Style Me Pretty with "The Most Elegant Island Style Elopement Draped in Florals". Read all the details in the full article at Style Me Pretty. Honored to have been featured on Style Me Pretty with "Adding a Tropical Twist to a Rustic Ranch Wedding". Read all the details in the full article at Style Me Pretty. Honored to have been featured on Style Me Pretty with "Hawaiian Wedding at Anna Ranch with Ruth Anne Photography". Read all the details in the full article at Style Me Pretty. A Shakespearean inspired wedding. Read all the details on Bliss In Bloom's Blog.